Thanks! Haha I was a mod a few years ago but I had to retire because of university commitments, but now I'm back! How were you selected? just curious. First of all, you ignored my friend request from forever ago. Bad form! Secondly, I need to ask you a question. WHAT??? I REMEMBER NO SUCH THING. Hey, buddy! How've you been? Long time no talk. Who are you on FB? Would you be cool with me adding you? Next thing after the air I'll be blasting energy pulses through Tokyo. It's good to see an old face in such unsettling new times. Hahaha, kind of not really. Lol. I still have my Taeyeon avie. Yo, so Luke says there is a free spot in your car?? When were you planning on leaving? Well stefan's hosting at his place after 4 for smash and other stuff for the biweekly. I could play a while with you guys too unless you guys can go too. I can always drive you guys from century. Been playing piano for the last year and stuff, not much else of note lol. It is pretty easy to lose time on here, although it's definitely not as entertaining as the heyday of post Brawl. So what have you been up to anyway? It does doesn't it? Sad I guess. Not much, I just saw your DR vid a few days ago and remembered "oh **** victraaa"
I found you on reddit! I still remember you my friend. Help me! 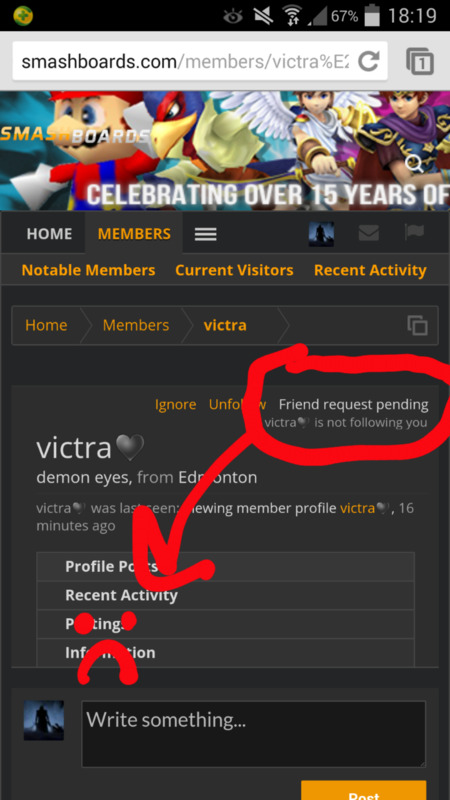 I have been gone for so long, I don't remember anyone (name changes don't help T^T) Help me almighty Victra! so since it seems I can never escape this song even when I want to im just gonna give in to it,so im gonna need you to tell me where I can find more of this.